Britain’s roads are rife with bad, and often dangerous, driving habits, that’s according to a study by business driving expert, The Fuelcard Company, which has identified the top ten driving faux pas being committed on the nation’s roads. The report also asked drivers about road rage with 38% admitting they felt they suffered from it, the DVLA currently lists 45.5 million drivers in Great Britain equating to 17million drivers suffering from road rage. 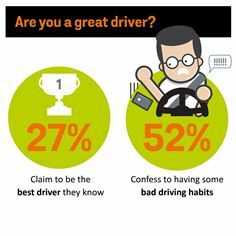 Almost a third of the drivers said they had seen a vehicle being cut up, more than a fifth (20.2%) stated they had seen someone get out of a car to threaten another driver and worse still 7% had actually witnessed a car ‘ram’ another vehicle.